About our Full Week After School Program. Our Winter/Spring 2019 after school program includes hands-on classes in musical theater, paper arts, outdoor adventures, writing, illustration, herbalism, urban gardening and more. The cost for the Fall Semester full week program is discounted to $1250, which equals ~$19 per day. Sliding-scale fees and full scholarships are available to families who qualify, and weekly or monthly payment plans are available to all. Contact us for an application. Free daily transportation is available directly from the MC Smith School, Hudson Junior High School and Promise Neighborhood, and returning to locations in Hudson, Greenport, Claverack and Stottville. Please contact us if your child will need transportation to and from our after school programs. Note: No classes will be held on February 18 - February 22 (Winter Break Camp); April 22 - April 26 (Spring Break Camp); April 29 - May 3 (Kite's Nest closed); and May 27. An end-of-semester expo with all participants and families will be held on Sunday, June 2. Do songs ever just burst out of you? With Sharece Johnson and Pamela Badila. Do show tunes get stuck in your head? Do you perform songs in the shower? Join us! In this creative musical theater club we’ll have fun playing hilarious improv games, singing our favorite show tunes, learning new songs and practicing our old favorites. We’ll recreate scenes from shows we love, get into costume, and practice our improvisation and acting skills. Along the way we’ll learn from guest performers, find out what musicals we love the most, and develop our confidence in taking the stage. Class fee: $475. Class fee includes materials and a daily healthy snack. Sliding-scale and full scholarships are available for qualifying families. Payment plans are available to all. Please request a tuition assistance application to determine your tuition amount or payment plan. Email hello@kitesnest.org or fill out this contact form to request an application or for any questions regarding registration. Calling all doodlers, drawers, poets and storytellers: a creative space for writing and illustration. Winter is cold. Writing and drawing can warm us up! Everyone is invited to join us for this after school creative writing and illustration club. Each week we’ll engage in writing and drawing games and exercises, experimenting with our own voices, styles, and ideas. We’ll fill our notebooks with exploratory doodles and freewrites, edit and revise our favorite work, have literacy-building conversations, and spend time both writing alone and sharing in a supportive environment. We’ll explore different genres of both writing and illustration, guided by our own imaginations: from poetry to drama, figure-drawing to comics. Maybe we’ll invent characters, write notes on candy wrappers, write letters to our future selves; maybe we’ll trace our favorite drawings, shade with charcoal, or make collages. At the end of our time together, we’ll host our own public gallery and reading! Class fee: $275. Class fee includes materials and a daily healthy snack. Sliding-scale and full scholarships are available for qualifying families. Payment plans are available to all. Please request a tuition assistance application to determine your tuition amount or payment plan. Email hello@kitesnest.org or fill out this contact form to request an application or for any questions regarding registration. Learn how to make beautiful hair styles for you and your friends. With Ngonda Badila. Braided, beaded, frizzy, gleaming, chopped or painted hair: all hair types will be celebrated! How do we use the art of hair to express ourselves? How do we respect everyone’s hair story? How is our identity connected with our hair? Led by international hair artist Ngonda Badila, in this after school studio we’ll learn the history and science of hair, as well as the techniques to bring your hair dreams into the world. As scientists, we’ll look under the microscope to examine our hair follicles. As artists, we’ll gain the mechanical skills for making box braids, cornrows, fishtails, weaves, yarn wrappings, clip-ons and DIY wigs, working with both hair mannequins and hair models to practice our techniques. You’ll also learn proper hair care for your specific hair type, and create natural hair care products like flaxseed hair gel and herbal shampoos. We’ll play with our hair and create jewelry adornments for our crowns with beads, wires and feathers. Class fee: $215. Class fee includes materials and a daily healthy snack. Sliding-scale and full scholarships are available for qualifying families. Payment plans are available to all. Please request a tuition assistance application to determine your tuition amount or payment plan. Email hello@kitesnest.org or fill out this contact form to request an application or for any questions regarding registration. The magic and chemistry of making potions, lotions, medicines and more. With Heylan Tsumagari, Zebi Williams, & guests. In this class we’ll transform our classroom into our own weekly spa and apothecary, learning to take care of ourselves and each other by creating our own lotions, sprays, face masks, soaps and remedies. We’ll learn to identify plants and their healing properties, transforming the plants around us into powerful and delicious medicines. We’ll travel to different farms and gardens, meeting and learning from local herbalists and medicine-makers. Each week we’ll mix and make concoctions as we learn to take care of our own bodies and emotions, our friends and families, and each other. Class fee: $525. Class fee includes materials and a daily healthy snack. Sliding-scale and full scholarships are available for qualifying families. Payment plans are available to all. Please request a tuition assistance application to determine your tuition amount or payment plan. Email hello@kitesnest.org or fill out this contact form to request an application or for any questions regarding registration. Constructing paper sculptures, costumes, crafts and more. With Pamela Badila. Did you know you can turn paper into…. almost anything? Working with artist and storyteller Pamela Badila, in this after school class we’ll explore the infinite possibilities of paper. We’ll make our own paper and books from scratch. We’ll discover the tricks of origami and traditional Japanese paper-folding, and try our hands at paper-making, paper-quilling, paper-cutting, paper mache and paper sculpture. Maybe we’ll build our own paper store (out of paper!) to share and sell our creations. In Hudson we’re surrounded by nature, but a lot of us spend our time only in the city! This weekly after school space is about exploration and adventure as we get to know the natural and wild spaces around us. As we enter the Spring season we’ll spend time with the Hudson Sloop Club, getting our feet wet and taking boats out onto the Hudson River. We’ll go out into the woods, facing survival skills challenges and building tree forts. We’ll track animal prints, learn to identify bird songs, and gain skills for outdoor navigation. We’ll visit the River City Garden, getting our hands dirty in the soil and growing food. Our weekly trips will be a chance to explore our own questions and curiosities, confront our fears of the outdoors, and discover new hideaways and secrets in our city’s backyard. Class fee: $250. Class fee includes materials and a daily healthy snack. Sliding-scale and full scholarships are available for qualifying families. Payment plans are available to all. Please request a tuition assistance application to determine your tuition amount or payment plan. Email hello@kitesnest.org or fill out this contact form to request an application or for any questions regarding registration. Get your hands dirty at the River City Garden! With Kristen, Vanessa and friends. Join us every Friday afternoon to grow our own plants, make our own soil, tend to our own garden and eat our own food! 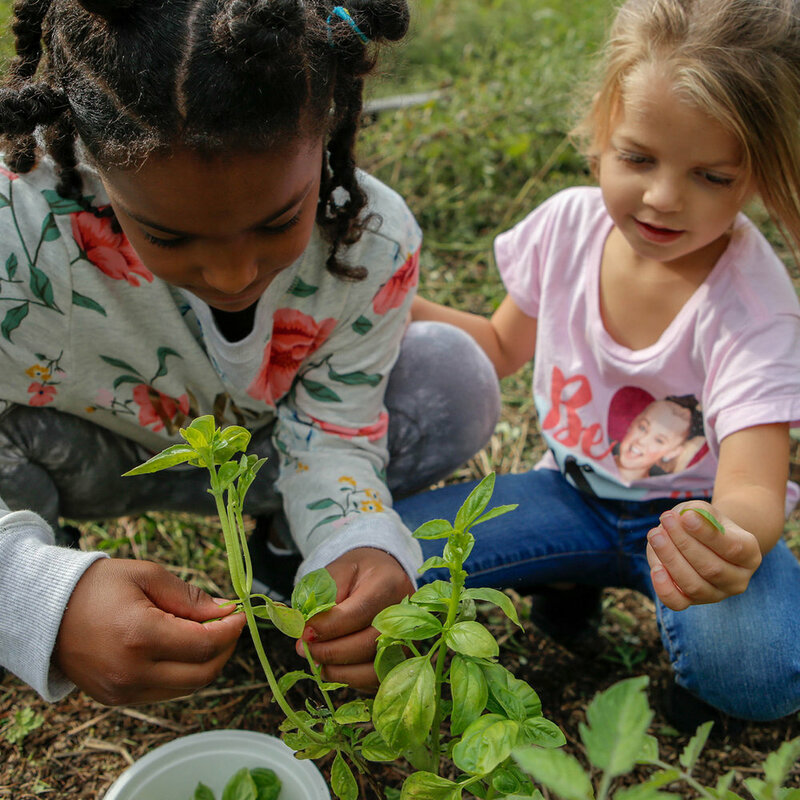 Together we’ll plant and harvest vegetables, examine the insects and microbes in our healthy soil, make observations about what’s happening in our garden, and take plenty of breaks to play games and each snacks. Free! Donations welcome. A weekly space by and for teens. With Sharece Johnson. Hilarious improvisation, acting, and video production for everyone. With Sharece Johnson. Working with geometry to create our own fashion lines. With Ngonda Badila. Learn how to make beautiful hair styles for you and your friends. With Ngonda and Ntangou Badila. Have you ever wanted to design your own games? With David Eustace and guest specialists. Get your hands dirty at the River City Garden! With Kristen, Kaya and friends. Join us every Friday afternoon to grow our own plants, make our own soil, tend to our own garden and eat our own food! Together we’ll plant and harvest vegetables, examine the insects and microbes in our healthy soil, make observations about what’s happening in our garden, and take plenty of breaks to play games and each snacks. Space 2.0 is a space for teenagers in Hudson to have as their own. We decide on our own activities and calendar. We go on regular field trips to see movies, hear speakers, and help out at community events. We cook and share meals, have cupcake challenges and cook-offs. We listen to and make music, produce our own Buzzfeed videos, make lip balm and throw dance parties. Space is a place for us to have honest and open conversations about what’s going on in the world and in our lives -- to get real about issues, and to gain the skills to be leaders in our lives and communities.